Extravagant Praise by Andi Oney tells us of the amazing things that happen both physically and spiritually when we praise God. Our hearts, attitudes, dispositions, receptivity, and our capacity for God are affected by our praise. Our hearts are softened and become more docile to the things of God. We place ourselves in a position of receptivity and surrender allowing us to create a pathway to receive more of the Holy Spirit. We have greater capacity for the multiple outpourings of the Holy Spirit. With all of this comes joy. When I first met Andi Oney many years ago, I was attracted to her beauty and her beautiful demeanor. I thought that she displayed that “hidden person of the heart with the imperishable jewel of a gentle and quiet spirit which in God’s sight is very precious” ( I Pet. 3:4). I knew her to be a woman with a deep love for her husband, family and the people of God and a woman who loved and studied the Word of God. My husband Al and I were with Andi in that Upper Room in Jerusalem when the Glory of God was manifest and Al was the one who placed his hand on her head and told her that the Lord was releasing her into ministry in a new way. That prophetic word has been fulfilled in a marvelous fashion. The Lord has chosen for that “hidden person of the heart” to be more widely known. It has been a joy to see how the Lord is anointing and using Andi to proclaim the Gospel and to lead people into the Baptism in the Spirit ever since that outpouring in the Cenacle. The Spirit of the Lord is raising her up as a bright light to be His instrument to the nations. I have been both blessed and challenged by Andi’s teaching in Extravagant Praise. She lives what she proclaims here about total surrender to Jesus and the call to live for the praise of His glory. I’ve been with her as she and her husband lead others into exuberant praise in tongues and in the festal shout. I’ve witnessed the way the power of God comes down when she ministers. As you read this book, you will also be encouraged and challenged to deepen your intimacy with Jesus Christ, to open yourself to the baptism in the Spirit and to grow in a life of praise. I read your book and found it to be a great blend of testimony, teaching, and, in my opinion, prophetic exhortation. I found it convicting, convincing, and challenging. I believe the Lord has used you to speak a necessary word today about a topic that is in danger of being greatly watered-down, “morphed.” or entirely lost in the CCR. I was blessed and amazed by your use of the Word of God. I remember that the Lord showed me years ago that you had a special anointing in the area of Scripture. I have great memories as well of the Upper Room prayer meeting when we formed a small prayer circle–you Deacon Larry, Fr. Bill, and I. I remember placing my hand on your head and saying that I sensed the Lord releasing you into a new ministry or a greater ministry. For someone like me who doesn’t receive a great deal of prophetic revelation, it is extremely gratifying to see this one fulfilled in you! Just a final word of congratulations on the book, of course, but most of all for being obedient to the Lord and willing to exercise your many gifts for His Kingdom. 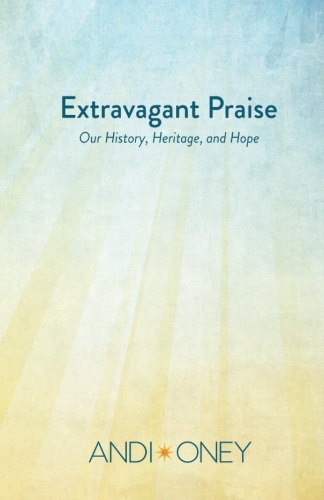 It is with great pleasure and gratitude that I recommend, in the highest terms, the new book, Extravagant Praise: Our History, Heritage, and Hope by Andi Oney. This is not only a book about prayer, but an invitation to the reader to pray. Mrs. Oney displays a wealth of knowledge about the Scriptures and those texts which have guided the Church at prayer through the ages. Her style of writing is engaging without being intrusive; challenging without being judgmental; and inviting while respecting the reader’s freedom. Mrs. Oney’s emphasis on praise serves as an important reminder that we are most authentically human when we acknowledge our dependency on the God in whom we live, move, and have our being. This recognition of our dependency moves our spirit to praise in gratitude to the God who gives good gifts to those who ask. I invite all who wish to begin a life of prayer, as well as those who are looking for a deeper relationship with the Lord, to read and pray Mrs. Oney’s much needed book. You will be deeply enriched through the Holy Spirit. As you read, meditate, and pray the message on these pages, your being will be prayerfully lifted to the God through whom we are wonderfully made. Mrs. Oney’s new book is a most valuable gift to those who desire to praise the Lord. Andi Oney’s, Extravagant Praise, puts praise back at the forefront, of what we are called to, as sons’ and daughters’ of the living God. Praise, as the highest form of prayer, draws us into intimate relationship with God and opens our hearts to His transforming Presence. Andi brings us into the heart of worship; its motivation, its meaning, its forms, and its power in our lives.